How to do forward bay parking on your driving test. Driving forward into a bay and then reversing out is a manoeuvre that you might be asked to perform on your driving test. 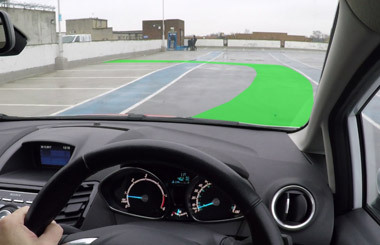 Hopefully this step-by-step guide to forward bay parking will help make your driving test a little easier. The safest and recommended way of bay parking is to reverse into a bay and then drive forward out. It's safer, as you can see whats in the bay that you're reversing into and also you'll be able to observe easier when driving forward out of it. But there are times when driving forward into a bay and then reversing out might be more convenient. If the examiner on your driving test wants you to drive forward into a bay, they'll direct you to a local car park. When driving into the car park look out for any pedestrians, cyclists or other drivers. If it's a car park near a park, also look out for dogs on the loose. Are there any one-way signs or markings? Maybe even a lower speed limit. The examiner will then say "I'd like you to drive forward into a convenient parking bay finishing within the lines, either to the left or to the right (if the car park allows it)." The examiner won't tell you which bay to use and you don't have to choose a bay next to another vehicle. Look out for bays that you might not be allowed to park in though. Video on how to do forward bay parking. Forward bay parking to the right. If you choose to drive into a bay on the right, you can make it easier by keeping to the far left, but check your mirrors first to make sure it's safe before moving over and don't drive through the other bays. This position will make it easier as you'll have more room to steer in and straighten up. 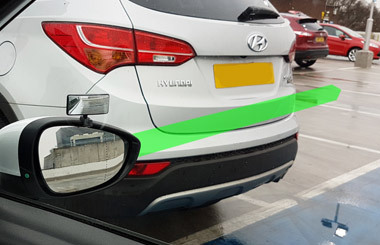 Before turning into the bay, check your mirrors for anyone going round you, blind spot, signal and then turn full lock to the right when the first line of the bay you want to go in, disappears into the car as shown on the picture. This reference point might be slightly different for you as it does vary depending on your height and what car you're driving but it will be something similar. Drive slowly, but steer quickly full lock, maximum to the right. Once you're in the bay, and nearly straight, start to straighten your steering back to the left. To make sure your car is straight in the bay, your dashboard should be in line with something in front of you, for example a wall. 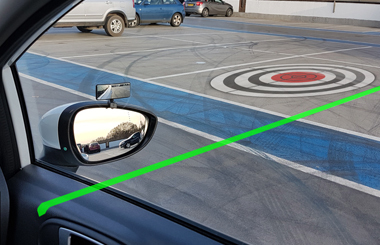 Stop once the line goes just under your right-hand mirror (reference points do vary but it will be similar). Stop before driving into the bay ahead of you if there is one. Apply the parking brake and select neutral. If you're unsure that you've parked within the lines of the bay, then you can open your car door if it's safe to check. Reversing out of the bay. At this point the examiner will say "Now, I'd like you to reverse out either to the left or the right (if the car park allows it)." Firstly, prepare the car to reverse. Then observe all around, including the rear window. Look out for any other vehicles, motor cycists, cyclists or pedestrians, especially children as they're more difficult to see. Be observant for other hazards too, such as shopping trolleys or hard-to-see bollards. Once it's safe, looking out of the rear window, reverse slowly. Check your mirrors as you reverse and generally observe all around for others. Stop if anyone approaches you and see what they're doing. If they stop and it's safe, then continue. Because this car park has a one-way system that I saw marked earlier, I need the back of the car to turn to the right. I'll reverse in a straight line first as I don't want to cut through the other bays and then turn. This is especially important if there's vehicles next to you as you don't want the front of your car to swing into them. 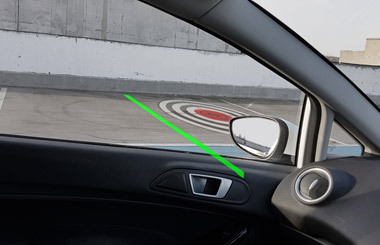 A good reference if there are vehicles next to you is to start steering slowly at first to the right, if you want the back of the car to go right, when the back of the other vehicle is in-line with the mirror (see picture). It's the same reference if there's a vehicle on the left. Make sure you've cleared the other vehicles at the front if there are any and then steer full-lock to the right. Look behind over your left shoulder and over your right shoulder for others and steer a little left before stopping as it will get your wheels ready for when you drive forward. Stop before reversing into the bays behind. Select 1st gear, observe for others (especially for anyone going round you), don't forget to check the blind spot over your right shoulder and drive on when it's safe. Forward bay parking to the left. Some car parks only have bays on the left and some only have them on the right, so make sure that you practice both sides. Forward bay parking to the left is similar to how do it to the right, but to make it easier to turn into the bay on the left, move away over to the right first to create space to drive in and straighten. Before moving over to the right, look ahead to make sure that there isn't any oncoming then check your mirrors to the right and your blind spot to the right for anyone going round you. Steer over to the right if it's safe. 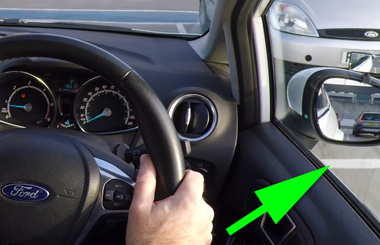 Before turning into the bay, check the mirrors to the left, blind spot to the left and signal left. The reference point for turning is the same as on the right just on the other side (check picture). Don't forget that all the reference points shown might look slightly different for you but they'll be similar. Drive slowly and turn quickly full-lock to the left. Once in the bay straighten the steering and stop (see picture when to stop). As before, the examiner will now ask you to reverse either to the left or the right depending on if there's a one-way system. 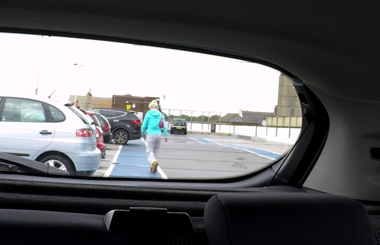 Observe all around, including the rear window before and as you reverse for other people using the car park. Once you've reversed, observe all around again including the blind spot on your left and move off when it's safe. Back to the other manoeuvres. 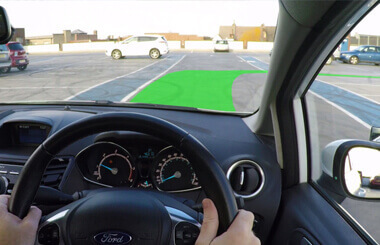 Read about the other driving test manoeuvres here including: pull up on the right-hand side of the road and reverse 2 car lengths, forward bay parking, reverse bay parking and parallel parking. Other manoeuvres that are not tested but recommended to practice are the 'turn in the road' and the 'reversing around a corner' exercise.